Workers at Presque Isle International Airport prepare a United Airlines plane during a snow storm, Nov. 13, 2018. Presque Isle International Airport and other airports nationwide are in the midst of adopting satellite-based landing systems, which could help prevent incidents like the March 4 landing mishap in Presque Isle. U.S. Department of Transportation Secretary Elaine Chao said during a March 27 Transportation Appropriations Subcommittee hearing that the Federal Aviation Administration is working with the Presque Isle International Airport and other small airports to add satellite-based systems. The Presque Isle International Airport currently uses an instrument landing system and a GPS system that relies on satellite, Presque Isle public information officer Kim Smith said Tuesday. Presque Isle “is working with the FAA to ensure that the ground based instrument landing system meets and will continue to meet industry standards,” Smith said in an email. PQI is the International Air Transport Association code for the Presque Isle airport. 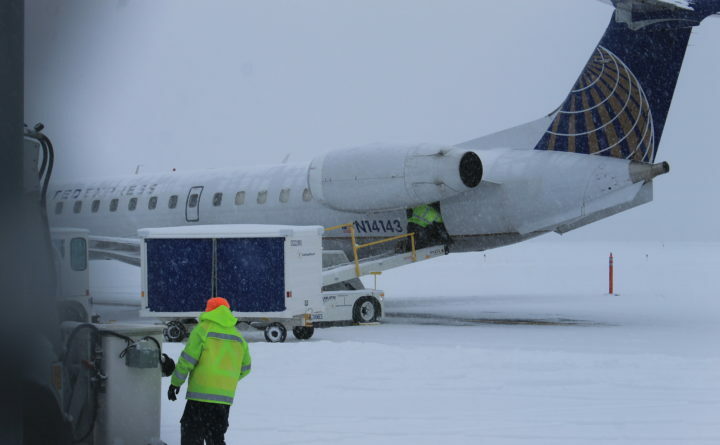 On March 4, a 50-seat Embraer 145 jet flying to Presque Isle from Newark, New Jersey, with 31 passengers missed the runway on its second attempt at landing, according to a preliminary report from the National Transportation Safety Board. The report, released on March 21, said the aircraft “landed between runway 1 and taxiway A in light to moderate snow.” The preliminary report does not say what caused the plane to miss the runway. A full investigation with findings of the cause and recommendations is expected to be released within a year. The full investigation also is expected to determine whether the landing system used at the time contributed to the missed landing. Chao said during the March 27 hearing that ground-based instrument landing systems “are affected by the snow and the accumulation of snow,” while satellite-based systems are less affected. It is not clear how the nine-day closure of the airport following the mishap affected ridership. Smith said that ridership information for the month of March has not been released from United Airlines yet. Presque Isle’s airport advisory board is holding its next public meeting at 3 p.m. Tuesday in the airport conference room.